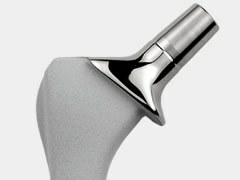 JRI Orthopaedics Ltd (JRI) specializes in orthopaedic implants and instrumentation. When relocating their manufacturing facility in 2007, new degreasing and cleaning lines were set up. JRI asked Lucideon (then Ceram) to independently verify the new lines in order to ensure product degreasing and cleaning was not compromised by the relocation of the manufacturing processes. Alkaline cleaning agents, tap water, citric acid, and purified water. A wide variety of product materials are also used: stainless steel, titanium, cobalt-chrome, plastics and ceramics. Process validation required an analytical approach, capable not only of quantifying the many potential surface species present on cleaned components but also of distinguishing between contaminants and bona fide product materials. The Lucideon ‘Validata’ service was uniquely positioned to meet this challenge. Despite the complexity of the system it is capable of distinguishing and quantifying residual contamination and, by the application of a proprietary combinatorial algorithm, then expresses the result as a single cleanliness index parameter in the form of a "%clean" figure. To compare the old and new degreasing-cleaning lines Lucideon needed to directly measure the surface composition of the products at each stage of the cleaning process. Whilst residue testing was considered - whereby the materials are extracted in solvents and the extracts measured - this was discounted as it does not provide a measure of the surface species remaining on the implant, only a measure of what can be removed by solvent extraction. XPS - to quantify the elemental and oxidation-state composition of the surfaces of cleaned items for the direct comparison of products from the old and new lines. The 'Validata' analysis showed the new degreasing-cleaning lines to be superior to the old lines with a reduction in surface contamination. Independent verification allowed JRI to relocate their production, confident in the knowledge that the new cleaning facility was capable of delivering improved cleanliness performance. The company was able to maintain continuous supply of a demonstrably improved product to its customers with no break in production from the relocation of manufacturing.